According to the modified Boston criteria, cerebral amyloid angiopathy (CAA) can present with lobar hematoma (LH) or superficial siderosis (SS). 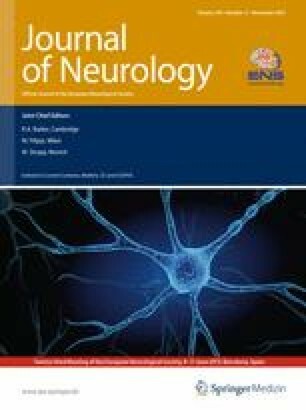 Recently, decreased CSF β-amyloid peptide 40 and 42 (Aβ40; Aβ42) and increased total and phosphorylated tau (t-tau; p-tau) concentrations have been described in CAA presenting with LH. Our aim was to analyze CSF biomarkers as a diagnostic tool for CAA according to the modified Boston criteria. We prospectively included patients with possible or probable CAA according to the modified Boston criteria. CSF was analyzed for t-tau, p-tau, Aβ42, and Aβ40. Data were compared with AD patients (n = 42) and controls (n = 14). Thirteen CAA patients were included, nine presenting with LH and four with SS. T-tau and p-tau levels in CAA were higher than controls, but lower than in AD. Differences in t-tau and p-tau levels between CAA versus controls and AD were all significant apart of the CAA p-tau levels comparison with controls. Aβ42 levels in CAA were significantly lower than in controls, and slightly higher than in AD, though non-significantly. Aβ40 levels in CAA were non-significantly lower than in controls, and significantly lower than in AD. Combining the findings of our study and the earlier report, we confirm that patients with suspected CAA have significantly different values for t-tau, Aβ42, Aβ42/t-tau, and Aβ40. Especially Aβ40 levels seem to be of clinical interest to differentiate CAA from AD. CSF biomarkers have to be analyzed in a larger number of CAA patients, and compared to patients with other disorders causing LH or SS. A.G. has received funding for travel expenses for AD conferences from Novartis. There are no other conflicts of interest to report for any of the authors.